This forum thread is dedicated for students who are currently enrolled in the free, online FL Mold Assessor & Remediator CE Course. share thoughts with other students. Feel free to scroll through these posts or jump to the last post. This is a photo of corrosion in PEX pipe fittings currently being classified as dezincification. 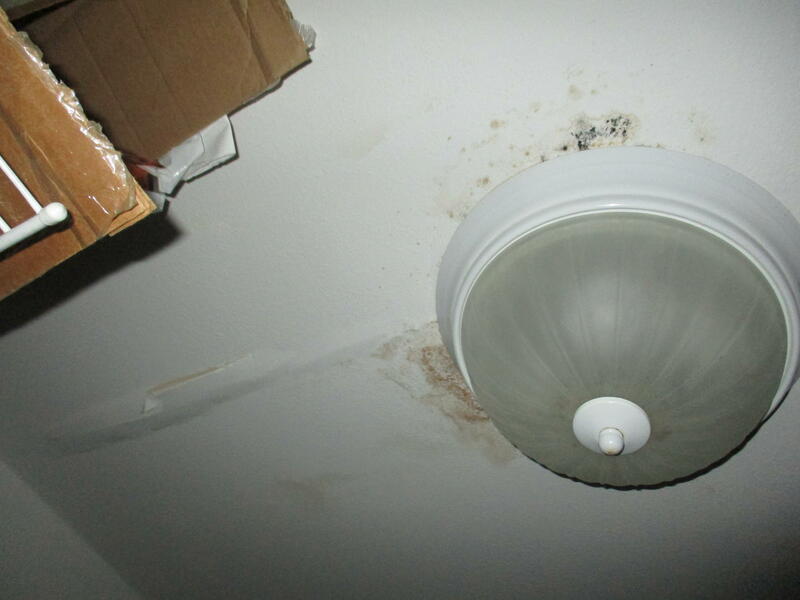 This condition is progressive, irreversible and will eventually lead to leakage and the potential for mold growth. Upon an external examination of the roof materials we visually noted several shingles missing and an area of vegetative debris. Upon entering the home for a microbial investigation we found the ceiling was fully involved with activity. This home is in foreclosure and we suggest a thorough examination of the attic area to confirm the roof has failed. We further recommend removal of affected area. 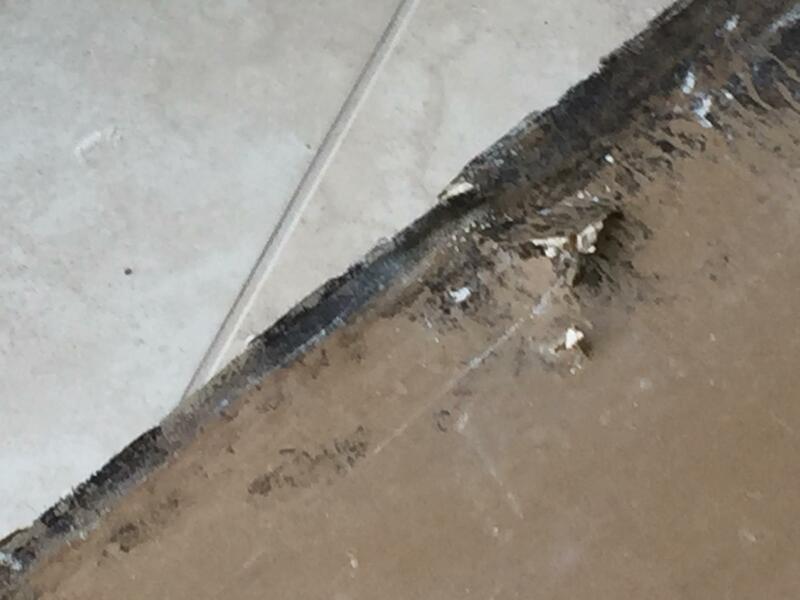 The importance of noting mold growth and damage while properly communicating the information to the client , is critical . This allows all parties to properly evaulate the situation in a timely manner. Organizing the remediation while proper communication will help to minimize the riak and exposure. I was called to a home in south Florida by a Home Watch, When I arrived the interview consisted of him explaining he just recently noticed a strange odor. When I entered the home, the odor was obvious. Humidistat was at 80%, thermostat on 82, and the fan in the on position. He furthered by saying he did not see anything wrong in the house. The interior HVAC inspection of the air handler is an important step in controlling the spread of mold spores throughout the structure. I inspect for surface mold inside the handler, the coils and especially inside of the blower. Most of the time, even when the coils are clean, I will discover that the interior of the blower will be caked with years of dust, pet dander, and likely mold spores that are consistently being redistributed throughout the house. I always recommend to my clients that the blower be cleaned each time that the coils are cleaned which I recommend being every six months. The roof type is intersecting hips. The roof was examined by walking on it. The roof covering is asphalt fiberglass dimensional shingles. Based on visible wear, its age was estimated to be less than one year. Recent weather has been wet. 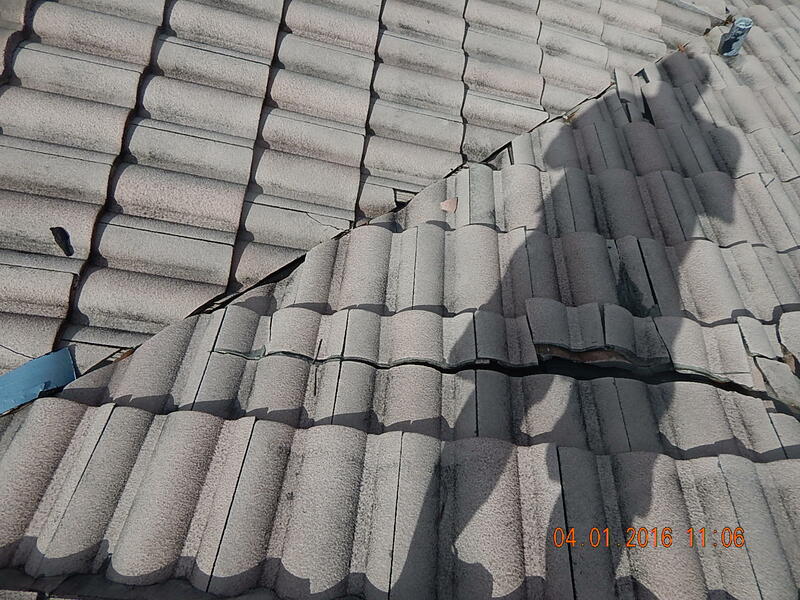 This type of shingle has a typical lifespan of 15-20 years in this part of the country. This varies widely depending on various factors such as exposure to sunlight, slope of the roof, ventilation of attic spaces, and color of the shingles. (Dark shingles achieve lower lifespans.) Lifespans are shorter here due mainly to the fact that the sunlight is stronger and shines more than in other areas. The asphalt/fiberglass shingles appear to be in adequate condition. No signs of active leaks were observed. They show signs of little or no wear typical for their age consisting of minor loss of mineral surface granules. The roof covering appears to be in the first quarter of its typical lifespan. 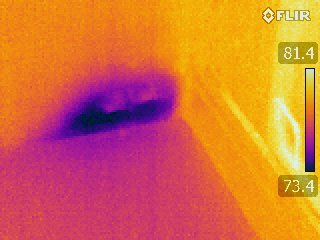 This is an active water leak in a bedroom closet along a ceiling drywall seam. The area tested at an elevated moisture level compared to the area around it. Upon climbing on the roof, pool solar panels were noted in the area in question. At the base of one of the panels there was a clip holding a pipe down to the roof that had come loose over time and deteriorated the plywood causing the leak to occur. We recommended a licensed roofer repair the damaged area and recommended further evaluation of the area in the attic for microbial growth since there is insulation in that area that did get wet. This is an image of crown molding with wood shrinkage and cracked caulked joints indicating previous water damage. 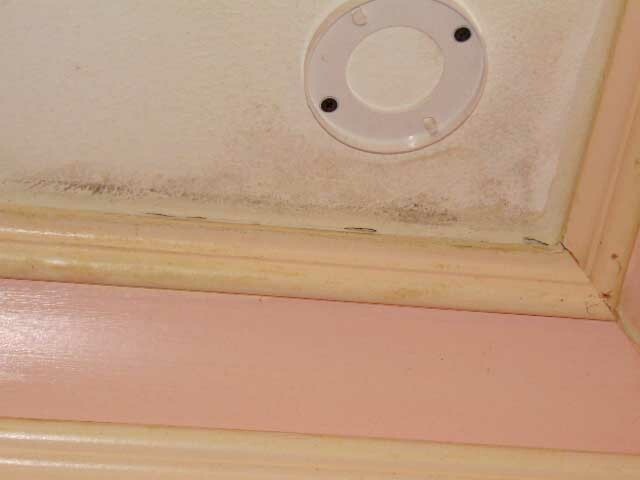 Also present is mold on the ceiling. The attic space above this crown molding was inspected. Stains on the underside of the roof deak above this ceiling indicate an old water leak. The in this area also had water stains, but was dry. The roof shingles had been recently replaced. The new roof appears to be in good order. While there is evidence of moisture being present in the past, there is no evidence of a problem now. The total area of mold is far below the 10 square foot threshold that would trigger a mold assessment. 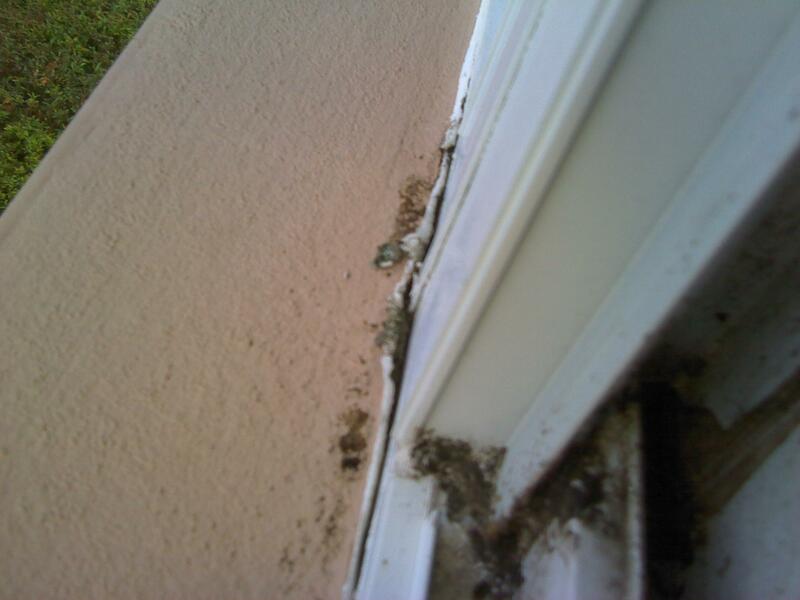 Upon an inspection of the residential exterior envelope, we identified areas of water pooling in window frame from debris accumulation in window weep holes, as well as, caulking deterioration around windows. *(We recommended that a certified general contract complete window inspection and make proposal for repairs and/or damage mitigation). 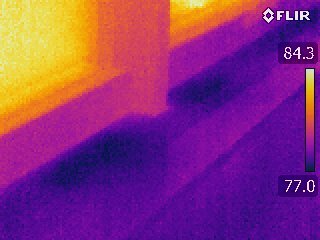 Upon entering the home for a leak detection and/or microbial investigation, we complete thermography scan and found moisture intrusion into the following areas: ceiling, walls and baseboard under the window(s). 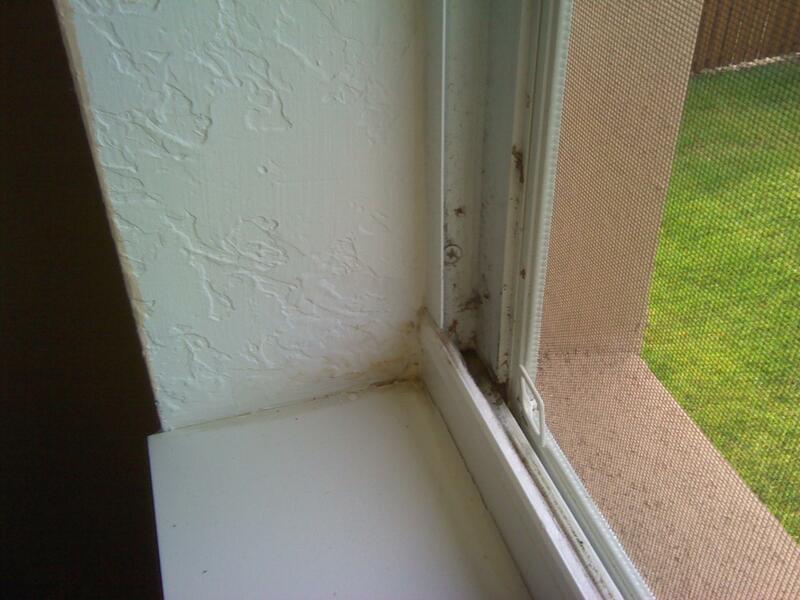 The tenants reported prior water dripping at top of window over treatments. The base board and walls were subsequently found to have mold growth behind them. We recommended a professional mold assessor complete inspection and analysis because the property involved tenants with a young child. This is a picture of a damaged cast iron waste line found in a crawl space of an older home. It is important as an inspector to access all areas of a home during the inspection that can be reasonably accessed so that problems such as this can be discovered. 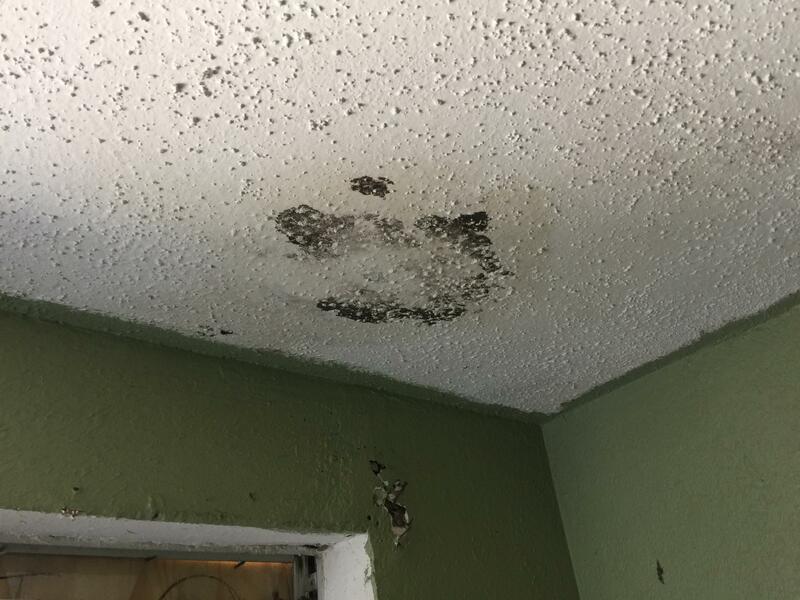 The attached pictures are from an inspection performed last winter (mid January) in an Apartment located in Hollywood, Florida. We were informed by the property manager of the apartment about a complain from the tenant living at the apartment about visual signs of what seemed to be mold presence in the unit. Signs of what seemed to be mold were detected by him approximated one month before the inspection in the walk in closet. Areas were cleaned. However new visible signs of mold appeared later. When the inspection was performed, signs of mold observed at the shoes storage furniture installed at the walk-in closet. When the relative humidity was checked inside the apartment at the beginning of the inspection, with the AC system OFF, high levels were detected at all rooms (range between 72% to 74%). Humidity was higher near the exterior wall facing the pool area. These levels were too high considering that above of 55 % to 60% is potentially favorable for mold growth. After the AC system was ON for approximated 20 minutes, the levels of humidity dropped to a range between 56% to 60%. AC unit coil was found clean and we were informed that the unit was cleaned recently. However we were informed by the AC contractor that did the service on the unit that an old repair done at the condensation water tray that is not visible (It’s a metal cover over the old tray) was found with mold when the system was serviced and even that the unit was cleaned as much as possible, the humidity trapped between the old tray and the new cover could be one of the causes of the mold grown at the apartment. Air samples were taken inside the apartment, on the Bedroom near the affected area. As per the lab results, mold concentration in the air were ABNORMAL and based on the mold counts, it was likely a mold source from which spores were able to become airborne and were an exposure concern to the occupants. 1- Humidity trapped between old condensation water tray and metal cover installed over. We were informed by the AC contractor that did the last service on the unit that an old repair done at the condensation water tray that is not visible (It’s a metal cover over the old tray) was found with mold when the system was serviced and even that the unit was cleaned as much as possible, the humidity trapped between the old tray and the new cover could be one of the causes of the mold grown at the apartment. 2- High humidity coming from outside the apartment combined with lack of the AC system working on winter: At the beginning of the inspection the Air Conditioning was OFF due to the temperature outside was relatively low (75 degree). However humidity was high (75%). When the relative humidity was checked inside the apartment under described condition (AC OFF), high levels were found at all places to (range between 73%). When the AC was turned ON humidity levels dropped around 57%. Humidity levels over 60% are potentially favorable for mold growth. 3- Lack of ventilation detected at the Walk-in closet. No AC diffuser was found at the room. These are photos taken at a hotel. The one photo is of a toilet that appears to have leaked at the bolts which hold the tank and the toilet in place. there appears to have been a at the point where the toilet tank meets the seat base. This was noted by the water rust stains running down the side of the toilet and what appears to be mold growth at the base of the toilet. The second photo is of under a sink determined to be dry with proper shut-off valves and P trap and place. 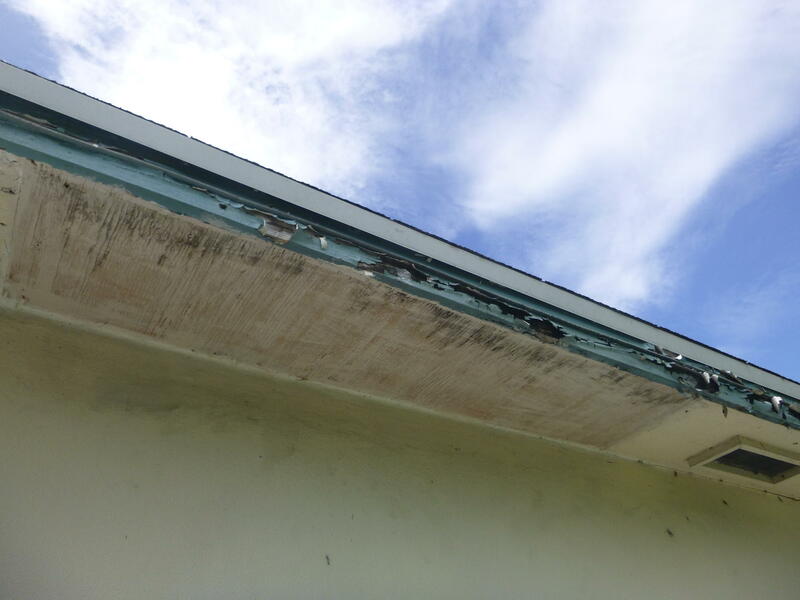 The photo submitted shows a water damaged fascia and soffit boards along a roof edge. The building materials have delaminated paint, wood decay, and suspect mold growth. The main reason for the damage in this location is the absence of the recommended spacing between the drip edge and the fascia board. General a half inch or more is required to avoid water from constantly wetting these areas from morning condensation drip and rain events. 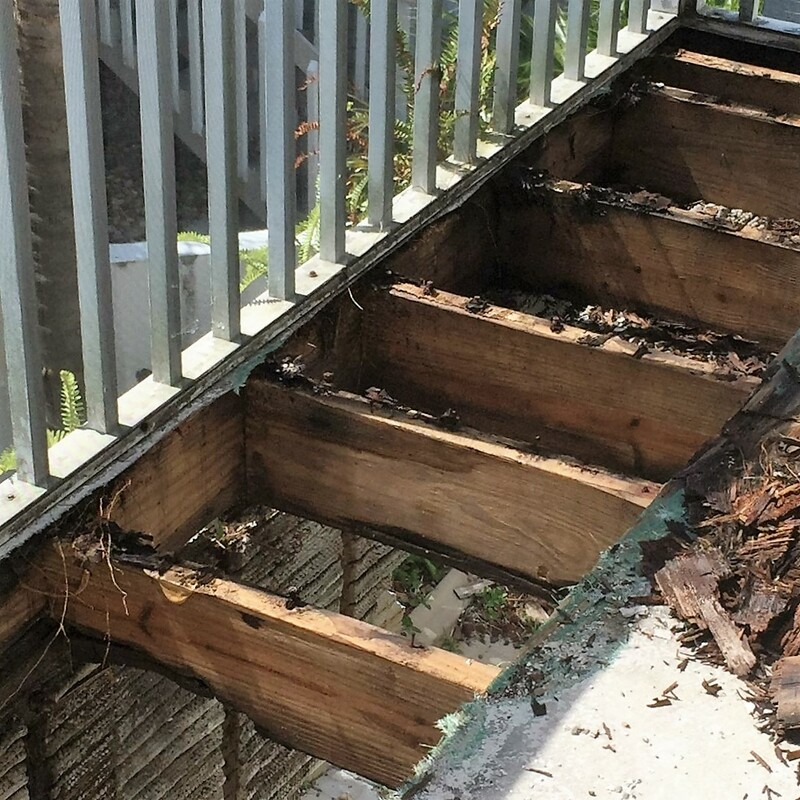 Inspection of a 2nd story tile over fiberglass deck with severe water intrusion, joists, supporting beam, ¾” sturdi-floor decking water damaged and delaminating. No evidence of water intrusion into residence. Recommend immediate evaluation by engineer and repair / replacement by general contractor. Moisture wicking up interior walls as a result of a plumbing leak in the hall bath. Water was migrating across floor systems, heavy odor was observed in room and RH levels were 58%. No visual growth observed at this time, samples taken and sent to lab for further analysis. This is a picture of mold growth in a living room. It is under 10 square feet. Personal protection used were gloves and a mask for identification. Then damaged drywall and baseboard was removed 2 ft beyond and around the damaged area and sealed in bags. It was determined once the drywall was removed that the moisture intrusion was coming from improper grading of the yard. Water was flowing to the house instead of away. Remediation consisted of sealing the exterior wall with a waterproof membrane, and using a dehumidifier and blowers with an air scrubber operating at the same time. The area was cleaned and painted with an encapsulating paint. Roof Life Expectancy: 25-30 yrs. Original tile roof. (Note age and weathering). Previous leak repair right side of entry. (Tiles not re-installed). Improper roof and fascia repairs noted. (i.e. cut through drip edge with saw at left elevation). Cut/damaged/loose roof tiles in two areas. Roof drip edge flashing leaks at front overhang. (Between garage and entry). Roof drip edge flashing leak at front patio post area. (Sloppy amateur previous repair same area). Roof leaks at right overhang at bottom of valley. Roof leaks over back patio. Roof leaks at back elevation overhang at bottom of valley. Roof leaks at left elevation overhang at bottom of valley. Roof leaks in the field above living room. Roof leaks in field above kitchen/family room. 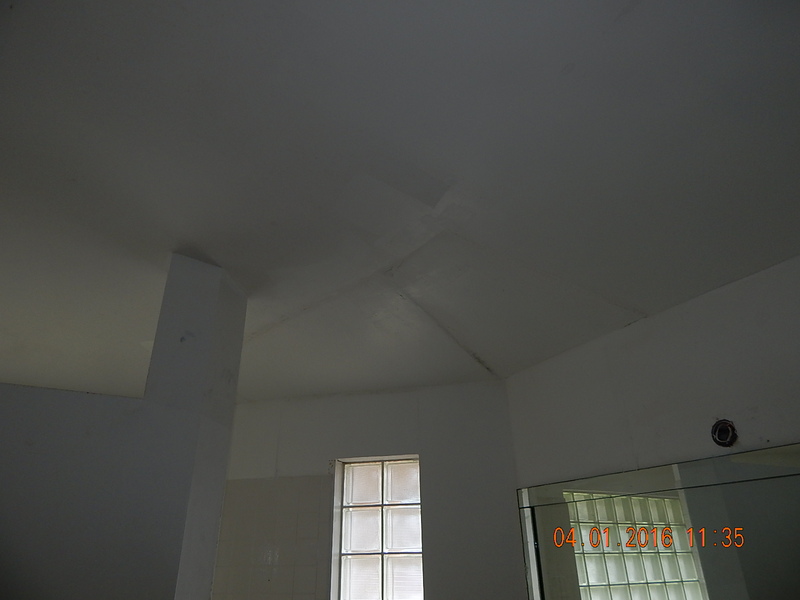 Due to roof’s age, previous leak repairs, loose/damaged/missing tiles and active leaks replace roof. Original roof vents. (Note age and weathering). This is a photo of some mold in a crawlspace several years ago. 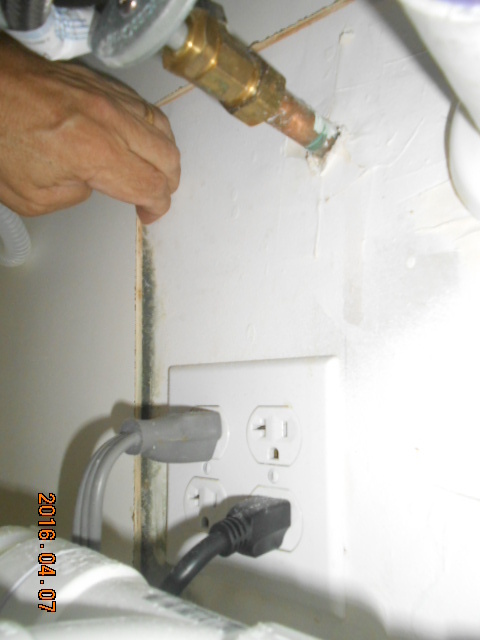 The cause was a slow leak from a water heater (hot side) for several years. The mass was almost 1/2 thick and about a foot across. I was doing the mold remediation and like any of us I love to take pictures of the cool things I find on sites. We replaced the water heater, performed the mold remediation in the crawlspace. Amazingly enough there was no water damage in the water heater closet.